Eco-Babyz: Bummis Potty Pants Giveaway and Easter Sale at Thanks Mama! Bummis Potty Pants Giveaway and Easter Sale at Thanks Mama! As you may know, I am the Social Media Manager for Thanks Mama cloth diaper store - so I have the inside scoop for you on all the goodness going on there! We are having an awesome Easter Sale! Today through March 31st, get 15% off your purchase with code EASTER. Certain brand restrictions apply. All orders over $150 will qualify for FREE GIFT that will include great baby essential items or toys with a minimum value of $20. Please make a note during checkout: FREE GIFT. Just as awesome is the fact that Thanks Mama now carry the new-for-this-spring Bummis Potty Pants! We'll share our own review soon, but I've got to say we absolutely love them! They are so easy to pull on and take off, have no bulk, and are waterproof to save your furniture. 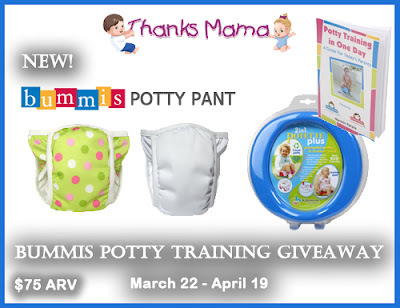 Enter to win two Bummis Potty Pants plus some other potty training goodies! Disclaimer: I did not receive payment for this post.